i would like to send you a sample or two to test the qualilty yourself feel free to contact me directly. Any plans to make any of the W.S. Flavours available on Amazon UK? The link from your website to UK has as only the syrups available on the site at the moment? My post was a kidding one, take no offense. I’m a huge tobacco fan and when I put “tobacco” in the search bar…no hits came up. No worries if you have no tobaccos. Believe me, there are PLENTY of other flavor manufacturers which sell tobacco flavors. Pay me no mind! Thanks for the tip. However, I’m about 99% off store bought juice. I used to purchase Bobas Bounty through Alien Visions, but they lost their tobacco base vendor and with it the secret ingredient to my favorite juice. Now, I just create my own from tobacco concentrates; less costly and I control quality and production. Well I’m going to try a few of these out it was a nice of @amovapeteam to send some flavors my way. I’ll get back to ya on the quality as far as the quantity it is plentiful. Now the overall % usage will be considered as well because we like flavor concentrates that are super concentrates that way we use less but don’t lose the flavor by doing so ! Sweet potato , natural speculoos cookie ,Natural birthday cake , wild strawberry ( which is a darker color will find out more on why it is darker ) , and natural watermelon. Interested to hear about sweet potato. I have Guava and Pumpkin from them. I haven’t tried them but I had them for food use and didn’t realize until this thread I could use them in juices. Sweet potato smells just like one…there is a certain creaminess smell behind it as well and then I feel like I smell alcohol in the end…Idk if they use any in the flavorings or not I’ll have to ask about that. Wild SB smells pretty close to SB shisha INW similar not the Wild SB thank goodness that grassy green fruit is gross to me overtime. The coloring reminds me of vanilla bourbon extract. Natural Watermelon smells very clean and crisp no seeds. Natural Speculoos- ginger snap like cookie with again an alcohol smell at the very end mildly. It looks like it may cloud as well from the looks of the liquid in the container most ginger flavors do even thou they are made as water solubles. Natural Birthday cake W.S. as well smells like a light lemon buttercream cake. 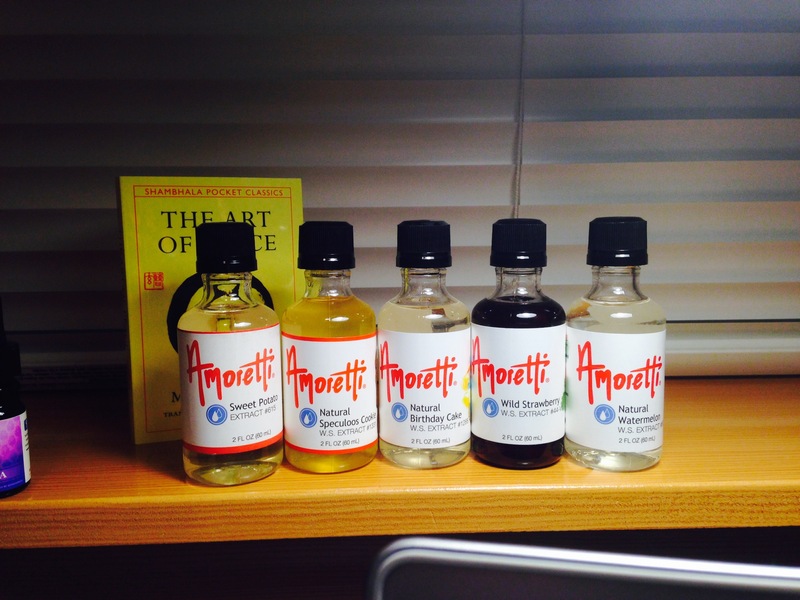 @amovapeteam out of curiosity do you use any alcohol in the flavorings. I need to look more at your web page to see the %s I should be starting these off on and as far as the concentrate goes are they all pg based or is there any that are Vg based or a mixture of the two. Pleasantly please with the looks and the clarity of each of them and the speed of your shipping. It was 9:30 pm when they arrived tonight so it’s too late to get any further involved w/ them tonight , but I’m eager and excited to do so tomorrow.Thank you. Interesting. Ive got a lot of flavorings to test right now but that one does interest me. I love some sweet potato and butter and sugar/cinnamon on it. I have used TFA yam for that and it worked out well. This one is a cleaner smelling potato where the yam is more root like less creaminess. Hi Amy we do not use alcohol as a carrier. that’s why we are a little more expensive. we haven’t decided to go the VG route yet. I recommend 8 percent at the highest. Can’t wait to hear how it turns out. Good Morning ! Thanks for getting back w/ me so fast. I got them late last night and was too pooped to play but did open them, smell them . then looked and tripled checked on the PDF that you sent Jason ( Darth Vapor) which he sent me to confirm they’re in fact W.S. extracts. I got a question …did Birthday cake change ? I have # 1268 and I seen on the Amoretti thread that JoJo listed a pic that had the top 20 vapable flavors well I think Birthday cake was numbered differently I want to say the pic states it as 1212 and I have from you 1268 is there different b-day cakes or a typo ? those are ok but good to know if they’re in there as to not combine other flavors that also have it in it to keep the levels lower. I try to start flavors out lower to see if I can get the best of the flavor w/o over doing it and makig them chemically strange so 8% maybe a lil high but at least I’ll know if I have to go up then it’s ok to do so. I’ll let ya know how it’s going as I get to them. Hopefully today I’ll get some batches made w/ them and then as well would like to know what they’re like as a Stand alone flavor. Hi Amy, No AP DP or any of them other weird chemicals. What you are seeing in the Wild Strawberry is a double concentration. we extract from the source so the run of is a little darker. Yay so it is still safe you’re saying since it is derived from SB that , it is dark and you run it twice to get it stronger or cleaner ?